We are still basking in those first warm rays of Spring, and not spending as much time crafting indoors. In our house these are the first signs of it’s arrival; Mr. and Mrs. 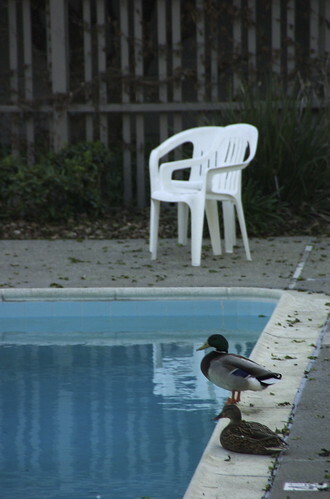 Duck arrive for their annual week-long visit, and the kids take their first dip in the barely-heated pool. Funny how these pictures make me feel warm inside, but chilled at the thought of that water — brrr! 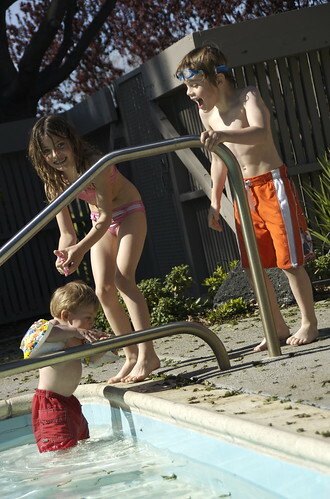 It is funny how the kids are always in such a hurry to get into a cold pool. It always seems like they don’t stay long, though. Keep enjoying spring! What a lovely post! I love the ducks and you kids by the pool. Isn’t living in Northern California just incredible? Thanks for sharing the pictures! Brr is right! I can’t imagine going swimming when warm for us here in NY is 50!